Naruto Shippūden: Gekitō Ninja Taisen! 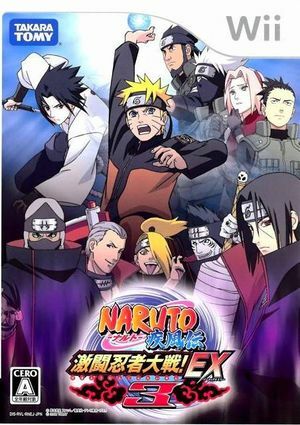 EX 3 is the seventh installment of the Clash of Ninja series. It was confirmed on August 29, 2008; it was released on November 27, 2008 in Japan. A new mode called 'Hurricane Clash mode' has been added, where players take on hordes of ninja in levels based on the series locations. Another feature was added, called Senzai Ninriki, in which players gain a new power when they reach Critical Mode. This game includes an original Naruto: Shippuden story line and the beginning of the Hidan and Kakuzu arc. There is also a tag team mode. Naruto Shippūden: Gekitō Ninja Taisen! EX3 is capable of using both GameCube controllers and Wii Remotes. If a physical controller is set to emulate both a GameCube Controller and a Wii Remote concurrently, it will operate both devices at the same time. To fix, migrate controls to use separate physical controllers. The graph below charts the compatibility with Naruto Shippūden: Gekitō Ninja Taisen! EX3 since Dolphin's 2.0 release, listing revisions only where a compatibility change occurred.